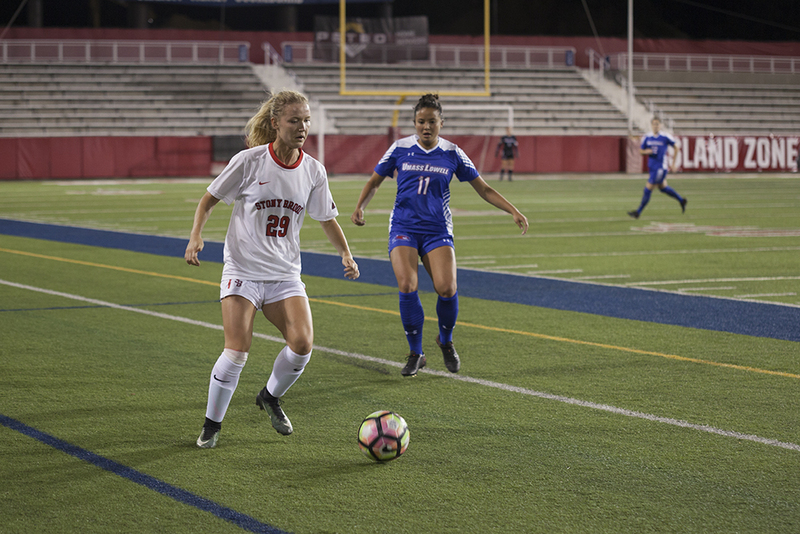 Just as the pouring rain never relented throughout the match across the Sound in Iona, neither did the Stony Brook women’s soccer team. The Seawolves took over against the Gaels in enemy territory on Wednesday, Sept. 12, securing their second consecutive 4-0 victory and evening their record at 4-4. Stony Brook quickly implemented an aggressive pace, firing two shots off in the first five minutes of the game. Sophomore forward Fanny Gotesson capitalized on the tempo in the 23rd minute, finding an opportunity on the counter attack and driving halfway across the pitch to bury the ball in the bottom right side of the net. Gotesson’s goal was the only score in the first half, but the Seawolves escalated the scoring in the second half. Senior forward Julie Johnstonbaugh was tripped up inside the box in the 58th minute, and the Seawolves were awarded a penalty kick. Sophomore forward Alyssa Francese took the shot and found the back of the net to put the Seawolves up 2-0. Sophomore forward Rachel Florenz scored a late goal to put the victory out of reach for Iona. Freshman midfielder Mari Brenden slipped through Iona’s defense in the 82nd minute and found Florenz, who redirected the ball in off the post for the third goal. In the 85th minute, junior forward Sophia Morell gave the ball to Florenz 18 feet in front of the goal, and Florenz drilled the shot to complete the beat down. The Gaels had a few near misses that could’ve brought them back in the game. Sophomore defender Katie Benson launched a shot in the 40th minute that banged off the crossbar, and redshirt-freshman defender Mackenzie Meixner bounced one off the crossbar in the 54th minute. Both opportunities could have tied the game at the moment, and if both had gone in Iona could have taken a lead that could’ve drastically shifted how the game was played. Instead, the Seawolves continued to dictate the pace of play and extended their lead. The road trip for the Seawolves concludes on Sunday, Sept. 16 when Stony Brook faces off against Hofstra at 1 p.m. The Seawolves have never defeated the Pride across six matches in program history, the latest being a 1-0 loss last year.